Your child's dental health is just as important as any other aspect of their physical development. That's why we recommend beginning regular dental visits around their first birthday. Besides getting them used to and comfortable with visiting the dentist, there are other solid reasons for starting this habit by age one. Here are 4 benefits for regular early childhood dental visits. Disease prevention. Children's teeth are just as susceptible to tooth decay as adults. Even primary (baby) teeth need protection so they can fulfill their role as guides for incoming permanent teeth. Besides monitoring and treatment for decay, we can also perform measures to protect teeth (especially in children at high risk) through topical fluoride applications or sealants. Bite development. We can get early clues that a child's teeth are not erupting properly and are on the way to developing a poor bite (malocclusion). If so, we can initiate measures to lessen the impact of a developing malocclusion, like installing spacers to help guide an erupting permanent tooth. Early intervention can lessen the extent and cost of later orthodontic treatment. Accident prevention. Disease isn't the only danger your child's teeth and mouth face. Even young toddlers can suffer mouth injuries falling onto furniture while playing or learning to walk. And the risk doesn't diminish as they get older, especially if they're active in sports. We can advise you on accident prevention tips and help fashion a custom mouth guard for that budding athlete in your family. Caregiver assistance. The most important aspect of children's dental care is what happens every day at home. We can serve as your dental “coaches” to help you get on the right track with daily brushing and flossing, as well as give you helpful tips on good dietary habits that promote nutrition and deter dental disease. We'll also help you work through other childhood issues like teething, thumb sucking or teeth grinding. 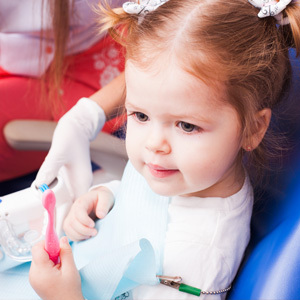 Think of us as your partners when it comes to your child's dental care. We'll do our part, and help you do your part too. If you would like more information on children's preventive care, please contact us or schedule an appointment for a consultation.